Your knees are a vitally important part of your body, especially in battle. Cripple your opponent at the knees and you take away mobility. If you do not want this to be you, protect your knees with our Fighter 1/2 Leather Leg Armour. 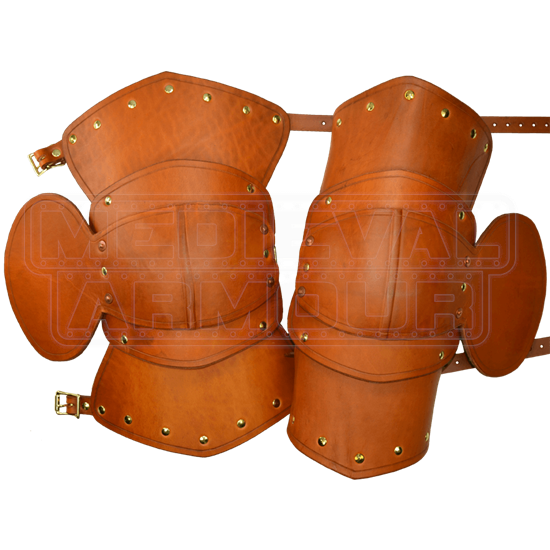 Made up of shaped leather plates that have been skillfully riveted into place, these pieces of knee armour are a perfect example of what a poleyn (knee armour) should be, protective, simple, and allowing for a full range of movement. Each piece is hand-crafted from quality 13/15 oz. leather that performs marvelously as armour. And these pieces can function as stand-alone additions to any existing protection you might already own. They do not have to be secured to any existing armour. They just strap onto the leg via a pair of straps and buckles, one across the top, one at the knee, and one across the bottom. If you are supremely confident in your ability to dodge and avoid harm, then all the more power to you. If you want to make sure your legs are protected at their most vital spot, then we can provide just what you need, in our Fighter Leather Leg Armour. If you like, you can pair these 1/2 Legs with under-knee greaves and thigh armour.